Cycling in the Finger Lakes Region is one of my favorite regions suitable for both a weekend gataway or week long bicycle tour. A short drive from Toronto you can expect to see many of the Ontario Cycling Clubs offering trips in this area. The Finger Lakes region is a collection of lakes in located just over the border in upper New York State. This area is well known for its many wineries, the famous gorge at Watkins Glens and is an excellent area for cycling along quiet country roads. The Backroad Bicycling in the Finger Lakes Region is an excellent guide with 30 routes. This is helpful as routes in the area are not signed and so you do require maps. The best time to visit for your Finger Lakes cycling is late September because it is the most scenic with the fall colors in their full glory. Spring time in May prior to Memorial Day offers great weather and great prices for accommodation. Regarding accommodation many of the bike clubs stay in colleges during the summer months in Keuka College or Geneva. Also available is camping, bed and breakfasts, vacation rental homes, cabins in some state parks and hotels. The higher hills are towards the southern end of the lakes. There are connections with either the nearby Seaway Trail or Erie Canal Trails (Buffalo to Albany) if you wish a longer holiday. While there are many Finger Lakes there are several more popular when bicycle touring. Each of these Finger Lakes has a personality of its own making it great for return visits. Most cyclists base themselves in one area for a few days of daily bike touring although you can go bicycle touring as well. My favourite area where you base yourself in or near quaint Hammondsport with shops, ice cream stores, restaurants, bed and breakfasts and a winery on the edge of town. A small park with a band shell is located in the town center. Departing town ride along Highway 54A and Keuka Lake, described by some as one of the most scenic roads in the U.S.A. Traffic is not an issue as it is all on the other side of the lake heading to the town of Penn Yann. When you arrive at Branchport turn left and head up Italy Hill (winery is half way up) before turning left again continuing along a ridge which parallels the lake for some great views. There are many excellent wineries to distract you along the way which is why many refer to this as the Keuka Wine Trail. There are plenty of other routes in the Keuka Lake area making this Finger Lake a good base for 3 – 7 days. This is the most northern of the Finger Lakes and is located near Rochester so it tends to get a lot of visitors from Ontario. The cycling routes in this area offer a fairly flat to rolling terrain with some long, gradual hills. 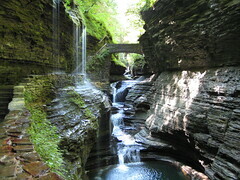 While the other Finger Lakes are more scenic this is a good weekend destination. This area is the longest lake in the region so there are plenty of cycling options. The terrain around Geneva at the north end of the lake is gently rolling. The road departing Watkins Glen involves a long climb on the eastern shores of Seneca Lake you climb gradually past waterfalls and plenty of wineries and a great descent on the return. However if you head south through the valley you can visit Montour Falls and continue to Corning and visit the famous glass museum. This way is flater but with more traffic. There are a number of routes on the western side of the lake as well all involving a hill climb out of town. The Glen itself is part of the state park with excellent camping and also offers a terrific 2 mile walk up the Glen carved ages ago into solid rock. Ithaca is home to famous Cornell University and the starting point of some wonderful cycling between the neighboring lakes. This is a great one day bicycle tour around this lake with a stop in Auburn which has many historic homes. Auburn is located on the north end of the lake and a state park on the south end. In between you will find quiet roads and some gradual hills. For more information on Bicycle touring routes visit Easy Bicycle Touring. Enjoy cycling in the Finger Lakes region with the variety of scenery, vineyards, waterfalls and great accommodation.